Maybe you’re wondering, Android secret codes hacks what actually means. What is Android secret code hacks? 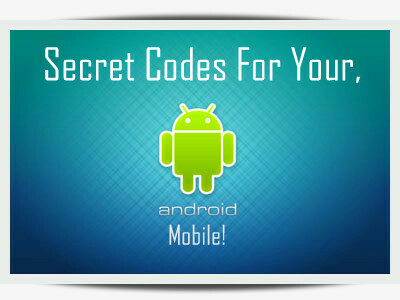 Yes, maybe you don’t know but it’s actually available to use and obviously, you can’t find these hidden android secret codes hacks on Android and that’s exactly what we’re going to show to you in this topic. These Android secret codes are very effective and easy to apply, you can perform so many major operations by using android codes on an Android device like Wipe, Reset, Restarting your device like checking out All Smartphone Details by just Applying just number of codes on Android Device. The best android secret codes list that you don’t know about it, some codes are useful and some are not, but you’ll definitely like some codes because of some codes of very useful. NOTE: Some of the Android secret codes hacks in this list are accessed like delete function, so be careful before using any code. *#*#4636#*#* Display information about Phone, Battery and Usage statistics. *#*#7780#*#* Resetting your phone to factory state-Only deletes application data and applications. *2767*3855# It’s a complete wiping of your mobile also it reinstalls the phones firmware. *#*#34971539#*#* Shows complete information about the camera. *#*#7594#*#* Changing the power button behavior-Enables direct power off once the code enabled. *#*#273283*255*663282*#*#* For a quick backup to all your media files. *#*#197328640#*#* Enabling test mode for service activity. *#*#232339#*#* OR *#*#526#*#* Wireless Lan Tests. *#*#1472365#*#* For a quick GPS test. *#*#1575#*#* A Different type of GPS test. *#*#0673#*#* OR *#*#0289#*#* Audio test. *#*#0842#*#* Vibration and Backlight test. *#*#232337#*#* Displays Bluetooth device address. *#*#8255#*#* For Google Talk service monitoring. *#*#4986*2650468#*#* PDA, Phone, Hardware, RF Call Date firmware info. *#*#1234#*#* PDA and Phone firmware info. *#*#44336#*#* Displays Build time and change list number. *#*#8351#*#* Enables voice dialing logging mode. *#*#8350#*#* Disables voice dialing logging mode. deletes application data and applications. Shows complete information about the camera. direct power off once the code enabled. For a quick backup to all your media files. Enabling test mode for service activity. For a quick GPS test. A Different type of GPS test. For Google Talk service monitoring. PDA, Phone, Hardware, RF Call Date firmware info. PDA and Phone firmware info. Displays Build time and change list number. Enables voice dialing logging mode. Disables voice dialing logging mode. If we’ve missed any important code, then please let us know by write in comments. What about *#12345# I think it works to the simplest phones for formatting. Thank you for adding a value in the post.